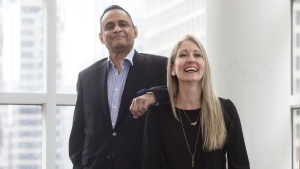 TORONTO -- They come from all walks of life, young and old: millions of Canadians who are unpaid caregivers for aging parents, children with a disability or a sibling with a chronic illness. Yet a survey reveals many are struggling, often in isolation, trying to fulfil a critical role with not enough support from the health-care system. Results of the Ontario-based survey of 800 caregivers aged 16 and older, released Thursday by the Change Foundation, paints a picture of people often thrown unexpectedly into a role for which they typically aren't trained and one that has major effects on their physical and mental health, relationships and careers paths. "Family caregivers provide the vast majority of care that happens in-between appointments with physicians or in-between hospital stays or different interactions with the health-care system," said Christa Haanstra of the Change Foundation, an independent health policy think-tank dedicated to enhancing patient and caregiver experiences. "There's a lot more health care happening in the home, provided in large part by family caregivers," said Haanstra, noting that caregivers are often invisible in the health-care system, with their contributions going unrecognized as well as unrewarded. "We really think about them as the glue that keeps the health-care system together." The online survey, conducted in May by the polling firm Pollara Strategic Insights, found that caregivers overall appreciated the time spent with their loved ones and believed they were improving their lives. But 61 one per cent admitted they took on the role because they believed they had no choice, with many at times feeling trapped, helpless, frustrated and overwhelmed. "Family caregivers are providing care to almost everyone -- siblings, parents, children -- and they cover diseases across the spectrum," said Haanstra, who has a young child and also helps care for both her aging parents and a relative with a chronic illness. "Obviously, the largest group is caring for people with health-care issues related to aging, Alzheimer's being one of them, frailty being another. "But we are also talking about providing care to people with cancer, with disabilities, mental illness, chronic diseases of many varieties and acute illness, post-injury or accident," she said, noting that an estimated 28 per cent of Canadians over 15 have taken on family caregiver role. 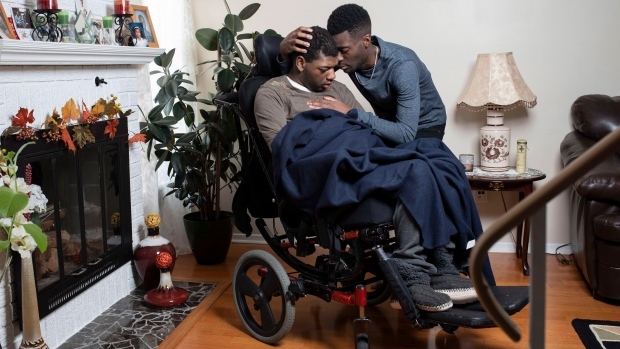 One of those is 25-year-old Stephane Alexis of Orleans, Ont., near Ottawa, who helps his parents care for his younger brother Torence, who has cerebral palsy and is non-verbal. "He's completely dependent, he needs help with feeding, changing, even turning in bed," Alexis said of Torence, 22. "He's a pretty heavy dude, so there's a good amount of lifting involved." Alexis, who attends a private photographic arts college, helps out after school and on weekends attending to his brother's needs, but their relationship goes far beyond that. "I love my brother a lot. I love spending time with him. He's funny, he makes me laugh." But Alexis admitted that even being a part-time caregiver comes at a cost. He's often exhausted, has little time to socialize with friends, and has had to put some life goals on hold. "I was planning on moving out (of the family home) relatively soon, but I feel like I can't do that. I can't leave and just let my parents fend for themselves." He's frustrated there's so little support from the health-care system: the family receives only 15 hours a week of help from two social services agencies. "It doesn't seem like there's really any funding for home care. They kind of just leave you out there," said Alexis, who believes his brother's quality of life is "better at home" than it would be in a publicly funded residence for people with special needs. "Why not use some of that money that you would be investing in a residence and use some of that money for home care?" For Don Mahood, frustration with the health-care system began when he was trying to get a diagnosis for his wife Mary Charlotte, who had been experiencing worsening memory problems for some years, forcing the registered nurse to give up her job. "I tried to get her diagnosed with the doctor with difficulty," Mahood, 76, said from London, Ont. "You'd get to the doctor and say my wife has some dementia. He would give her a test and talk to her for maybe 10 or 15 minutes and tell me she's perfectly fine. Anyone with Alzheimer's, especially in the early stages, can really mask it." Mahood finally got a referral -- a year later -- to the Aging Memory Clinic in London, where doctors in 2012 confirmed his wife had Alzheimer's. For the next six years, Mahood was Mary Charlotte's 24-7 caregiver, until his wife of more than 50 years was moved to a long-term care facility about a year ago. "At the end, I had to dress her, bathe her. I had to do everything, she couldn't brush her teeth," he said. "When I look back, I don't even know how I did it myself. "I was worn to a frazzle." "So my friends became others that were going through it ... I would never have survived if I hadn't belonged to support groups. That really saved my life in a sense." Haanstra said such stories along with the survey results demonstrate that the health-care system must do more to support caregivers and make it easier for them to access existing services. "They're willing to do it, but we can't just send them home with no support and no information and expect that they're going to succeed."